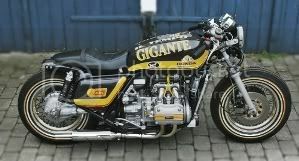 The NGW Project Bike. 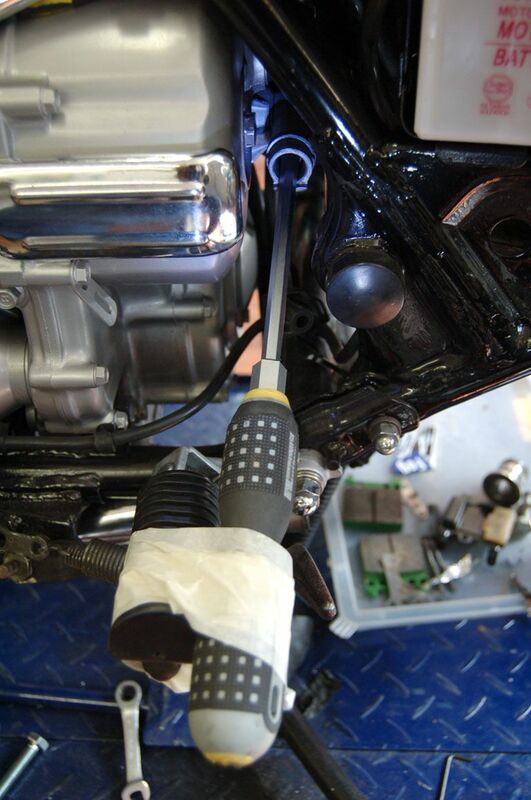 DYNA ignition.How-to TIME / ADJUST - NGWClub®, Inc.
a screwdriver or something and then tape it down. 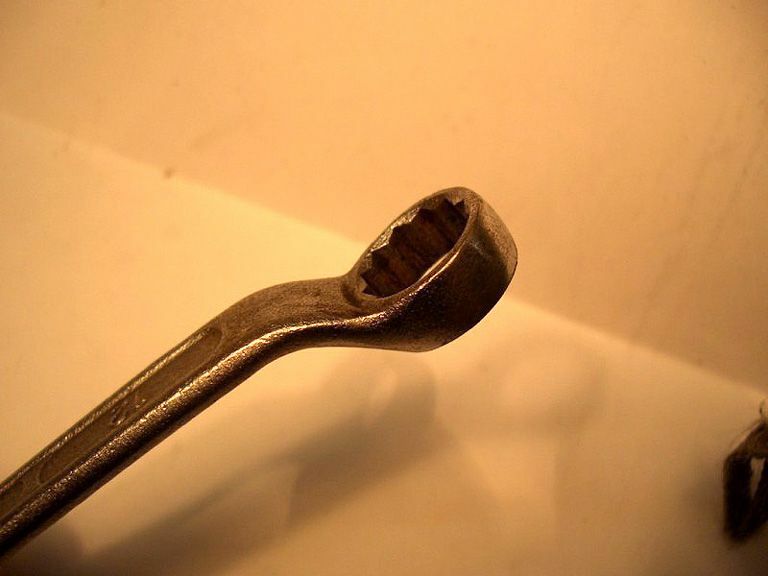 Makes it easier to handle that 12mm spanner. 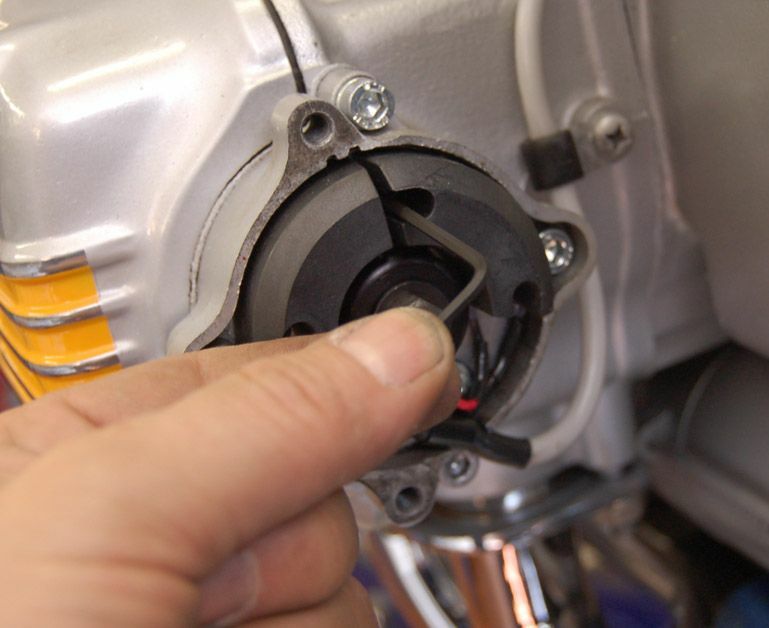 ( As an alternative, on the kick-start models, you can do as one of our members "guy plain"
".. I use the kick starter to turn over my engine to do the tuning. I put the bike on the center stand and roll it over..
...if i go to far i put the bike in gear and use the back tire to bump the makes into place..
..this is the EXACT point where the test-light should come on. 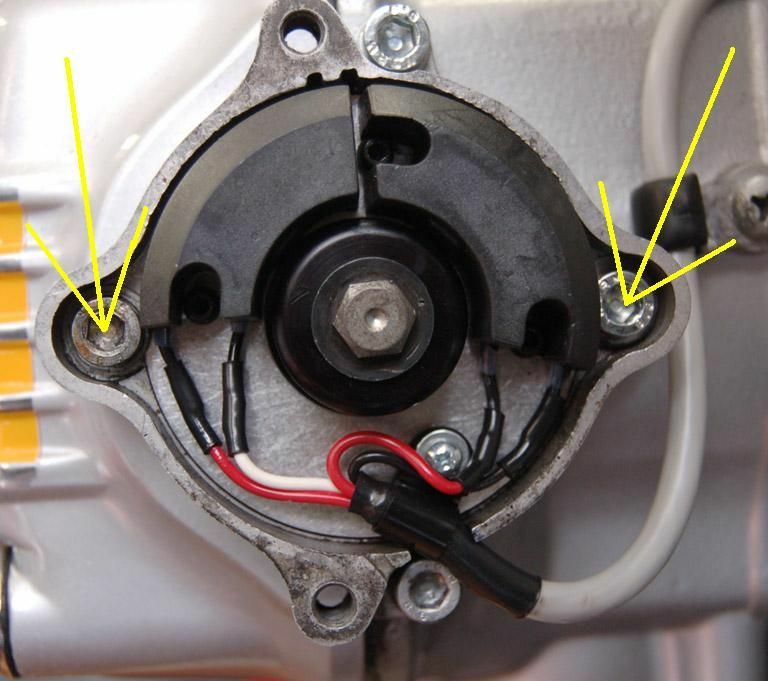 Moving it anti-clockwise will give a later ignition. Please remember to tighten it again. light-on / F2 mark alignment is SPOT ON !!! So do the whole thing over again till it's there. Chances are you'll have to do it several times. till the light come on, and tighten the screws. light-on / F1 mark alignment is SPOT ON !!! and you will have to re-adjust that one as well. 'turn it backwards' procedure is a DYNA recommendation. It really isn't such a good idea. 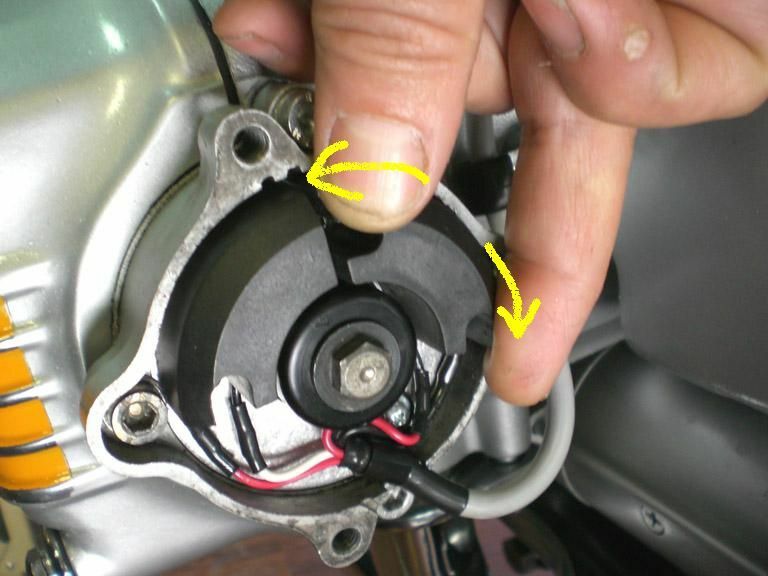 "Hi..I recently purchased a 1979 Gold Wing with a rattle in the engine at idle that went away when revved up. It was not the primary drive chain. Turns out the 12 mm bolt on the end of alternator rotor that you use to turn engine when setting points was loose. Apparently someone turned it backwards and loosened the bolt in so doing. 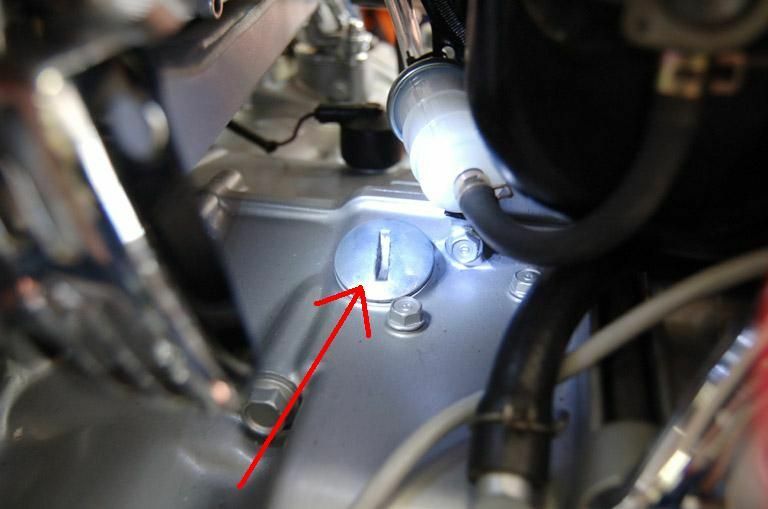 A good thing to check if someone has a rattle in engine..Arthur"
Thanks to Randakk for pointing that out. 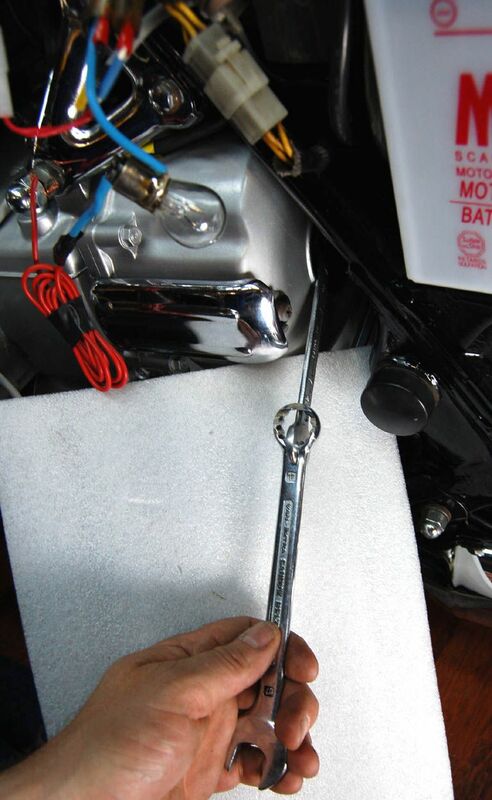 dryoung wrote: I put a Dyna ignition in my ÃƒÂ¢Ã¢â€šÂ¬Ã¢â€žÂ¢77 wing last winter. I had [..snip..] problem [..snip..] of not being able to get the 1-2 sensor dead on. I could see where the 3-4 sensor could be moved on the plate. I could move the 3-4 sensor a bit counter clockwise. to get 1-2 much closer but still not perfect. the factory slot just a bit longer. both 3-4 and 1-2 dead on. I guess I was just not willing to compromise on the ignition! Last edited by octane on Thu Jul 03, 2008 1:32 pm, edited 7 times in total. Excellent job as always. I really like the High Tech test lite. Available at your local super store for .59 plus a little solder..
"If you don't know, You can't ask why?" Octane... You rule! I've been searching the posts and finally you've come to the rescue,(as usual)! Can't wait to try timing tommorrow. Awesome tips octane. I can't wait to try out all your tips an my bikes! 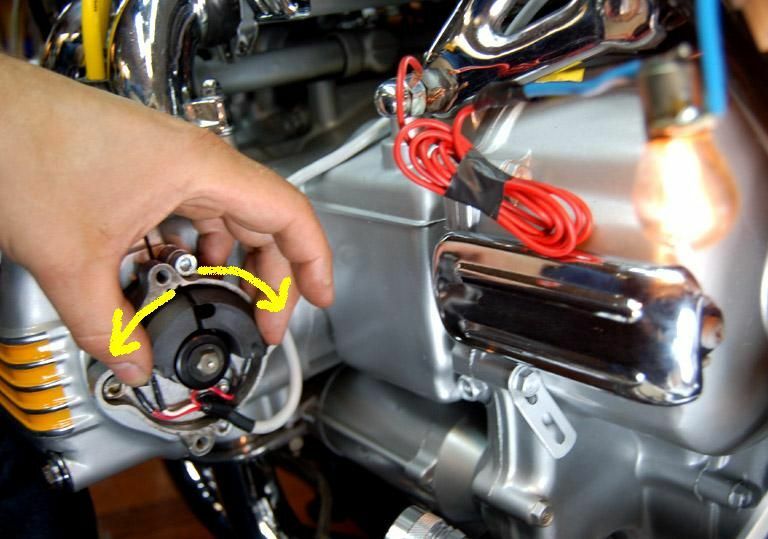 Is the Dyna ignition affected by the split timing that affects the stock points? I'm thinking seriously about switching over at some point as tuning those buggers is killing me! 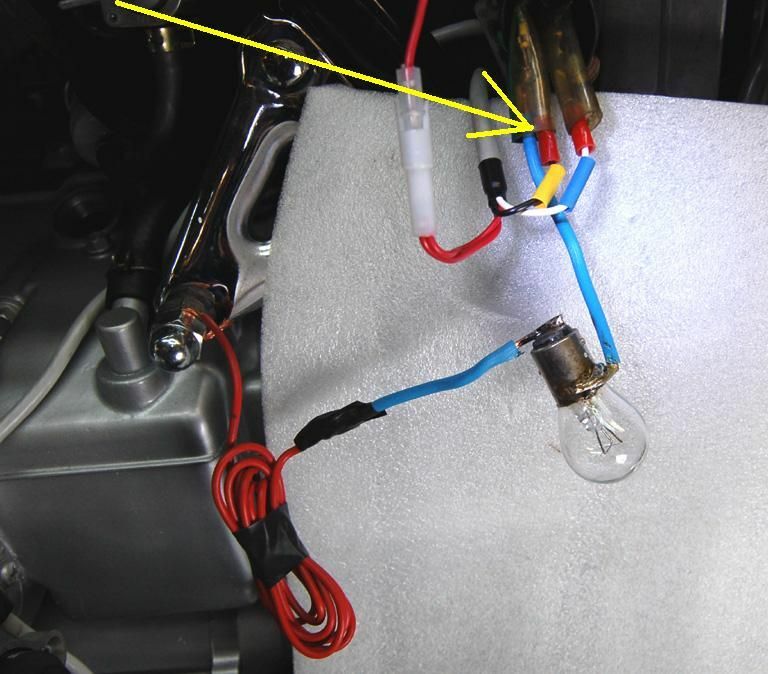 When I tried this the other day, the test light wouldn't light, I was cranking the engine by hand with the kick starter. 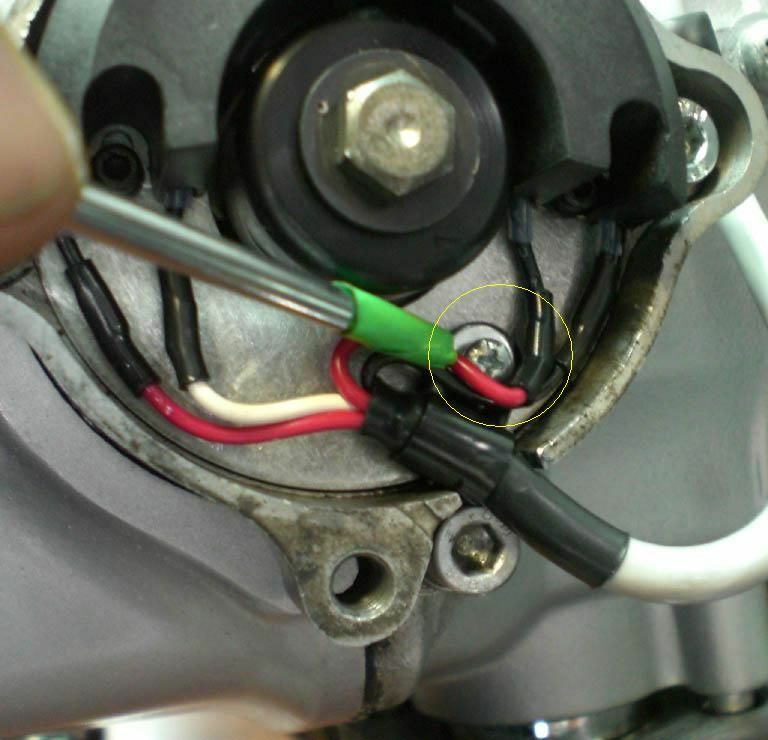 When I tried doing it with the electric starter, the light lit. 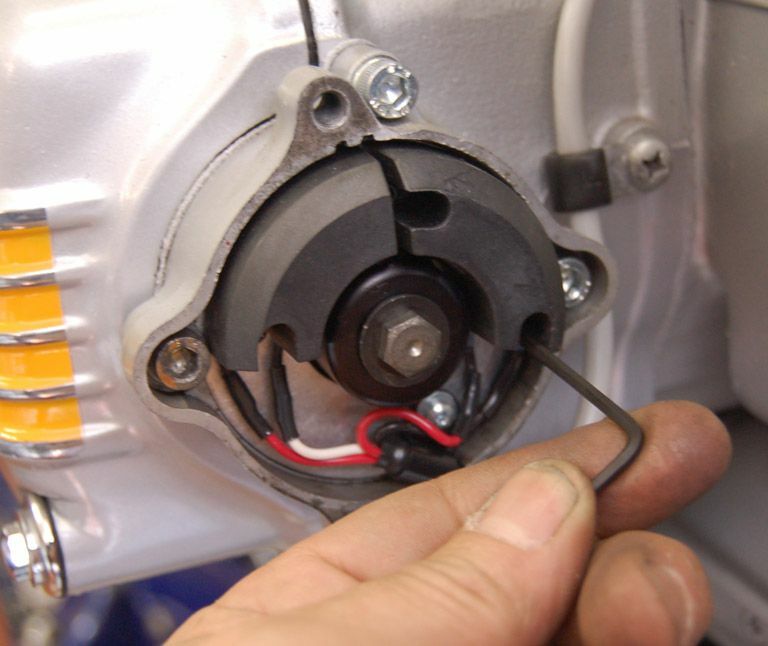 Is there some sort of jumping I need to do that occurs with the electric starter? UniCacher wrote: Is the Dyna ignition affected by the split timing that affects the stock points? I'm thinking seriously about switching over at some point as tuning those buggers is killing me! The short answer is NO. The dyna is not effected by split timing. I do not know why but on my 1000 the split timing was getting to be a problem with a split of 3/4". With the dyna setup there is zero split. I checked it several times and it is dead on for every rotation?? Someone with a bit more brain power than me is gonna have to explain why. Did you have the key on?? 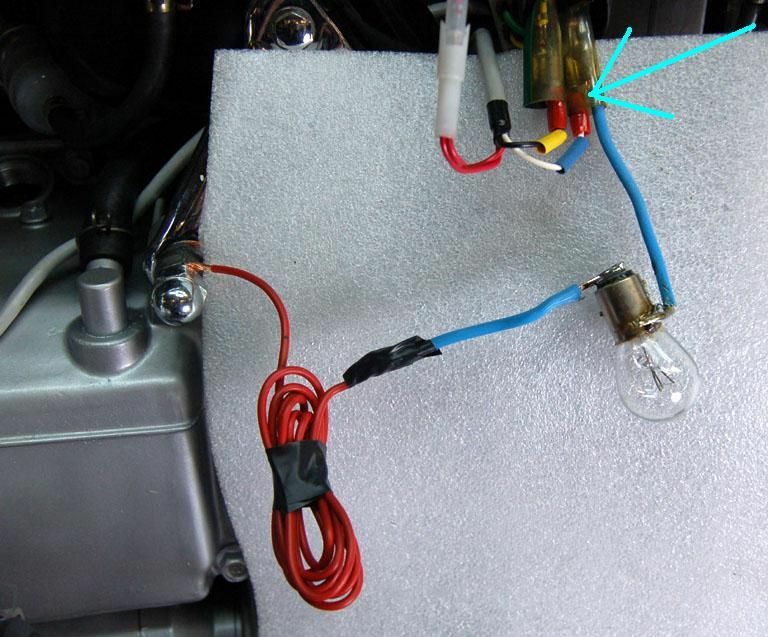 I will also add that I'm using a brake light bulb (two filaments), if it matters. I have the ground lead going across both contacts. Then I am stumped. Key on and Kill switch to run the light should illuminate just like when it is being operated by the starter. 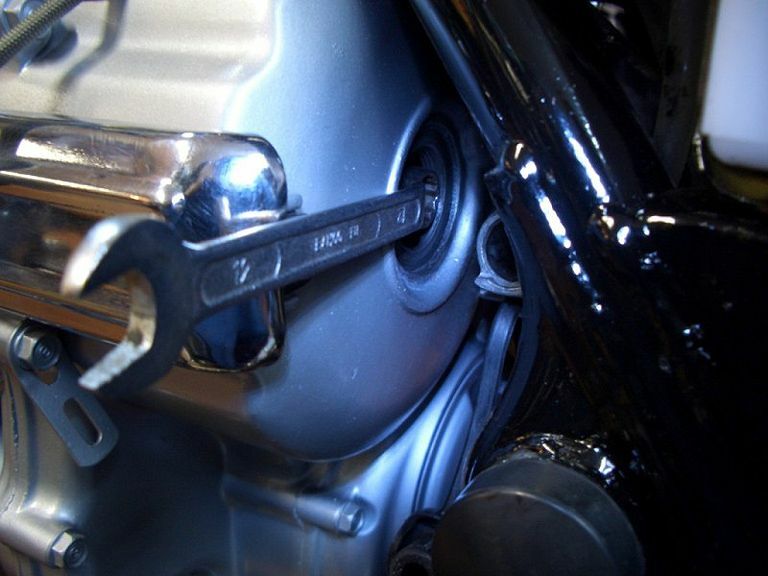 Can you start your bike with the kicker? I've yet to actually try to start it with the kickstarter for as long as i've owned it (almost three years now), and I suppose I should get in the habit of trying that. Right now, it's still in winterized mode as I'm waiting for my mercury stick to arrive. In the meantime I figured I'd adjust the valves and time it. I'll give it aother shot this weekend. 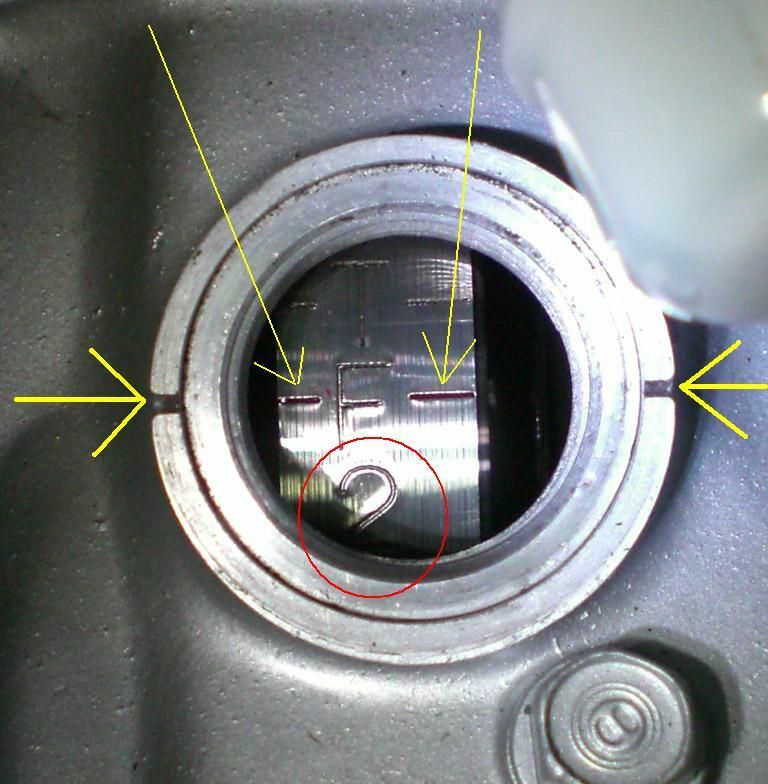 putting a dial indicator on the camshaft. (or extremely little) inconsistency in the timing. 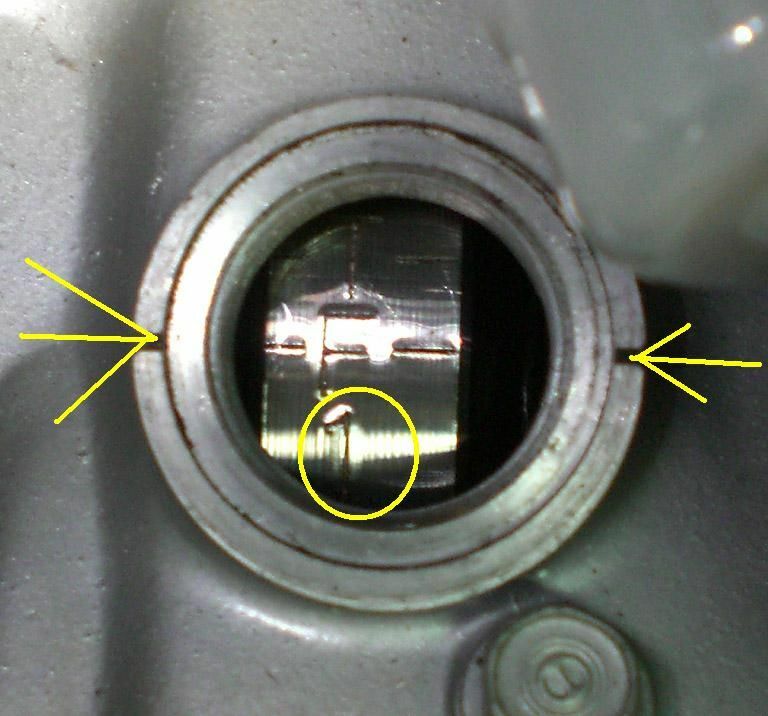 slight movement of the camshaft ....."
making 'room' for more unwanted shaft movement.